Slow Cooker BBQ Pot Roast over Cheddar Ranch Grits - chuck roast slow cooked in a homemade BBQ sauce and served over Quick Cheddar Ranch Grits - this pot roast is SOOO good! I wanted to lick my plate! EVERYONE LOVES this pot roast! Growing up I was never a pot roast fan, but since starting this blog I have found several pot roast recipes that I really like. Of all the recipes I've tried, this might be my favorite. The roast was extremely tender and juicy, and the sauce was tangy and has a little zip to it. 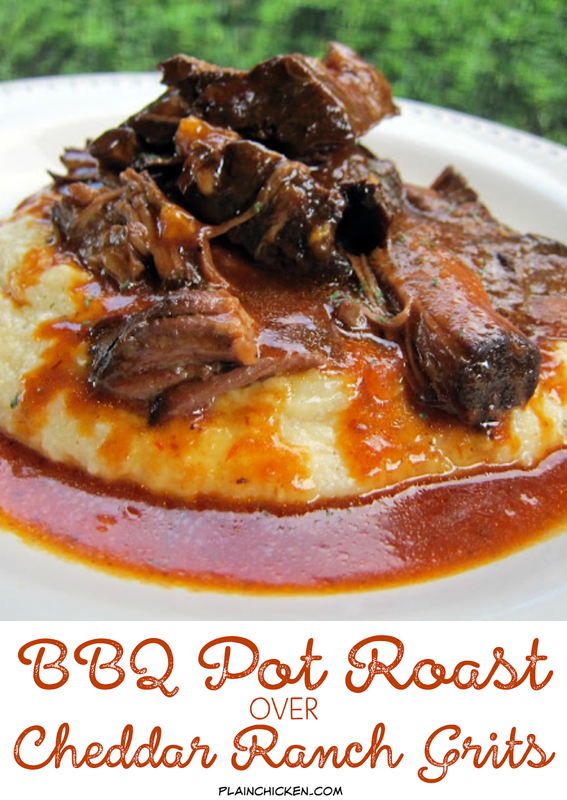 I served this roast over some Cheddar Ranch Grits - OMG! The grits were good enough to eat all on their own, but were incredible when combined with the roast. This was SO good that I want to make it again next week - seriously! Sprinkle garlic salt and pepper over roast. Place roast in 6-quart slow cooker. Combine coke, chili sauce, worcestershire and hot sauce; pour over roast. Cover and cook on high 5-6 hours or on low 8-9 hours. Remove roast from slow cooker, reserving juices in slow cooker; keep roast warm. Combine cornstarch and milk, stirring well; stir into slow cooker. Cook, uncovered on high 15 minutes or until thickened, stirring occasionally. Serve sauce over roast. In a medium pan, bring chicken broth to a boil. Slowly stir in grits. Reduce heat to medium low. Cook 5 minutes, stirring occasionally Stir in Ranch mix and cheese. Cook until cheese is melted. Serve immediately. I had BBQ pork over cheese grits last night, but have never tried the ranch! We would love for you to share over at our FIRST ever Tasty Tuesday linky party! What a fantastic neat idea to put ranch in grits. Have eaten them all my life and never had them other than plain, butter or cheese. That roast on them sends them over the top. Looks delicious! I never know what kind of roast to use. Is there a specific cut that comes out best this way? Will definitely have to try this one! I JUST made these grits to go with my leftover roast from last night. My grits dried up very quickly and I like them runny. I will make them again b/c the flavor was amazing! I will add much more broth next time! Thanks for the recipe. Suzanne - I do like my grits a little firmer. I am not a runny grits girl. I have NEVER liked cooked grits at home and now- two recipes in a row that make them DELIGHTFUL! I'm in love!!! This is going on the meal plan for next week! Thanks, I can't wait! Is chili sauce that red stuff that looks kind of like ketchup? Just want to make sure I am getting the right thing because this looks delicious! Jennifer - yes - it near the ketchup as well. Tried this last night and I thought it was awesome. The only thing I changed was to use veggie broth instead of chicken (so I could feed my vegetarian some grits.) Thanks for the great recipe! Made this for tonight's dinner and it was delicious! oh my word...I want that plate right now!!! haha...yum! Is chili sauce "siracha"? Is it super spicy? Thanks!! Taylor - no, it is a spicy ketchup. It is near the ketchup and cocktail sauce. It isn't very spicy at all. I immediately started drooling when I saw the pictures. Oh lordy, this MUST happen and SOON. I made this today & substituted a Diet Dr Pepper & didn't use hot sauce then shredded it up before adding it back to the gravy. Served on hoagie roll. It was super yummy! Thank you! gurrrrrl - this is a slow cooker slap FULL of ridonculousness. such a winner of a recipe! thanks for sharing. my family absolutely loved it. Carla - glad to hear it was a hit! What kind of hot sauce do you use? This recipe looks amazing! Can't wait to try it! Heather - I used Crystal's hot sauce. I hope you enjoy it as much as we did! Hi! I'm working on a round-up of grit recipes for The Huffington Post Taste and I came across your recipe. I'd love to include it in my piece. Contact m if you're interested. Thanks! Julie Thomson - I'd love for you to include this in your recipe round-up. I accidentally combined the milk and cornstarch with the rest of the ingredients. Hope it still turns out ok.... :? This was great but the ranch was way too much. I'll leave it out next time. This dish was the hit of Thanksgiving! The cheddar ranch grits were amazing! And the roast was a hit with everyone, even folks who don't care for grits! I did have to use a little more liquid... the grits were a bit too thick. I don't like runny grits, but I do like them just firm enough to eat with a fork. An extra cup of broth about three minutes into the cooking did the trick. Wonderful recipe, I can't wait to make it again! Just made this for dinner and substituted venison for the beef. I also used 1tbl sriracha instead of traditional hot sauce. I also did not like the thick grits. Package directions calls for 1/4 cup grits to 1 cup of liquid. Otherwise it was wonderful! I made this on Sunday! DELICIOUS! We're having a party at Tumbleweed Contessa - What'd You Do This Weekend? This would be a great hit. Hope you can bring it over. Made this today and it was incredible. I used fresh garlic cloves instead of the garlic salt because that's what I had. I also used Dr pepper instead of the coke and sriracha for the hot sauce . Man oh man was it incredible!! Will make again in the near future!! Being from Texas I'm picky about my meat and BBQ and this dish did the trick!! The entire family enjoyed it as well. Thanks for posting this. I made this last night and it was delicious. My son ate it but didn't really love the "gravy". I think because it was not the traditional beefy gravy. It was one of a few recipes I have found on Pinterest that actually came out just like the picture!! Thanks, will make it again. I just went to the store to pick up the stuff to make this tomorrow! Hubs loves pot roast but I don't usually make it in the warmer months. With this one being "bbq" it is going to make a great meal that I'm sure he'll love. Have you ever used Dr Pepper instead of Coke? Lisa - I haven't tried Dr. Pepper but I am sure it would be just fine. Enjoy! Made it today with Dr. Pepper and it was AMAZING! Will definitely make this again! Thanks! Lisa - so glad it was a hit! I will have to try it with the Dr. Pepper next time! Yummy! I made this at home exactly what is above, and the dish is delightful. Thanks for sharing.. Try these sites www.gourmandia.com for more fantastic recipes. Oh my goodness! Making this the first chance I get. Hubs will love me forever. wow!!!! just had this for dinner and it was amazingly awesome!! I'm am so making this this weekend! I bet the leftover pot roast (assuming there is any) will be great on a po'boy. Thanks for posting! This was delicious, my family loved it!!! I've never had grits before (California girl here), but the picture looked great. I have no comparison on how the grits should taste and/or feel, but it was kinda weird. I tried it when it was done and I was worried that my family would not go for the texture OR the flavor. I served it in a bowl with the meat on top and drenched it in the sauce. Ohhh, that sauce! The grits were not at all an obstacle once the sauce was on it. The meat came out perfectly tender and I will definitely make again. Thanks! You had me at the photo. This looks and sounds so good, I can't wait to try it! OMG! Made this yesterday. I'm not really a fan of pot roast either, but this.....to die for. I browned the meat outside on the gas grill and then followed the recipe as written. The only change I will make next time, and believe me there will be MANY next times, I am going to pour the sauce in a gravy separator and pour off the fat before thickening with the cornstarch/milk mixture. The grits were fabulous. Could have made a meal of those alone. Thanks for sharing. What exactly is "chili sauce"? Is it like sriracha sauce? It is like a spicy ketchup - you can google "Heinz Chili Sauce" to see what it is. I also am really wanting to know what the chili sauce is, because I think of sriracha. 12 oz of sriracha seems like it would be very hot. Is it a sweet chill sauce like the Heinz brand? Is the measurement for hot sauce correct? I assume you mean Tabasco or something similar. Seems like 2 Tbsp would be unbearably spicy. Should it be 2 tsp? Thanks! Looks delicious! I used Frank's hot sauce and I did use 2 tablespoons. Adjust to your tastes. Enjoy! This was easy and delicious. My whole family liked it. Roast comes out tasty and tender. Liked it over the grits. Next time I will probably leave out the Ranch dressing. Didn't add much for me. I'm good with just the cheesy goodness of the grits. This is a keeper and one I would serve guests.